No More Unnecessary IN-HOME Consultations! Because we’ve sold and installed tens of thousands of generators and we’ve developed proprietary online tools our experience allows us to provide you with a firm quote over the phone. We can size your equipment, provide financing, process & schedule your entire order. For that our clients get FREE 10 year extended warranties, FREE Smart Home or Security Starter Kits, access to FREE entertainment memberships, Discounts on The Mobile Grid Whole Home Monitoring. Over $2,700 value! The Trust Factor. First, a home generator is a really important investment. So make sure you really trust your installer and the equipment they are using. We have found that many installers and dealers disappear after the installation. So they may not respond when your generator doesn’t start. The Mobile Grid is there for our clients for the lifetime of the system. Equipment. There are some great manufacturers out there but we tend to focus on Generac and Cummins. 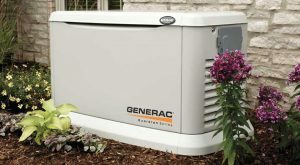 While Generac is by far the leader in the residential category and Cummins in the commercial category, both make solid products with good long-term warranties. Maintenance and Emergency Services: Your generator is no different from a car. It needs annual maintenance and sometimes, when you really need it, it doesn’t start. A reasonable annual maintenance plan is a good idea – so consider it in the cost of your purchase and make sure your dealer offers an emergency program or find another dealer. Monitoring. The monitoring of a generator is changing. Thankfully, it’s getting smarter. You don’t want to learn that your generator is not starting the day before the day of an impending storm. Most monitoring is reactive. We believe in proactive. You should want to know when your generator needs oil, annual maintenance, or has some faults (these are items that may prevent the generator from starting). A good monitoring service should be able to clear most faults remotely and get your generator started remotely as well. The Mobile Grid Voice Control allows you to talk to your generator through your Amazon Alexa or Google Assistant. No more looking at control panels just ask “How’s my generator doing?” and you will learn all about your system. Know if it’s ready to go, if there is upcoming maintenance, if your system has a fault, or it even contacts your dealer to schedule appointments. Sizing a Generator. For those of you who want to save a few dollars by getting a generator to power part of your house please consider this: in most cases we’ve found that the difference between powering 1/2 of your house vs. the whole house is approximately $500 in equipment costs. Sometimes it’s a little more but even an additional $1,000 is not worth the hassle of powering part of your home. But there is another reason to consider powering your entire home. If you look around most of us are now consuming more energy because of our connected homes. The average homeowner has 20 connected devices and growing. Smart appliances, like TV’s, dishwashers, washing machines, lighting, security, Alexa and Google Home, iPads, iPhones, are consuming more power than ever. The extra equipment cost can future-proof your home plus give you what we refer to as an “uninterrupted life” when the power goes out.